Ground Floor Plan: 3 Garages, Lounge, Entrance Porch, Entrance hall, Atrium, Kitchen, Scullery, Dining, Family Den, Guest Bedroom suite, Staff room, Patio – A Regal Bali Style House. First Floor Plan: 4 Bedrooms (2x en-suite), Bathroom, Pyjama Lounge, Central balcony. Stretching out almost 31 meters wide, this elegant double storey Bali style home design provides ample room for convenient and happy living. The exposed rafters and wide roof overhangs, which has become identified with authentic Bali style, is the dominant feature of the exterior facade. With handsome twin-paired windows, this Bali style home features a large patio and balcony that has two large surface openings to let the sun into the central spaces of the house. The open floor plan leads the lounge to a central dining room that opens through a wide sliding folding door onto the patio. A spacious kitchen features a central island and a substantial breakfast counter. The scullery is spacious enough to accommodate common household appliances. The guest bedroom is ideally situated towards the back of the property for privacy. A staff room with a compact bathroom is accessible through the outside courtyard. A PDF house plan will also show tucked away towards the northern side of this Bali style house, a the spacious family den. Both the lounge and family den opens onto the patio. This 500m2 Bali inspired architectural design is divided into two functional levels. The upper floor consist of 4 bedrooms and ablutions together with a cosy family den. As you reach the top of the stairs, the spacious family den is located to your left. The family den is a great place to spend some quality time with the family but can also be used as a playroom. The family den extends through to the balcony allowing air and light to flow in the Bali style home. The bedrooms are positioned on each corner of the upper floor. One bedroom has access to its own bathroom while the other two share a common bathroom. The master bedroom is spacious. The space in the master bedroom allows you to add a couple of furniture to create a small private lounge area. The master bedroom also has a walk-in closet and its own full bathroom. It also has access to the balcony just like one of the other bedrooms. 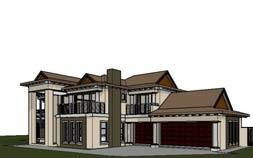 Every purchase of construction drawings from Nethouseplans will consist of both the CAD and PDF house plan copies. The PDF house plans can be useful for remote printing. The purchaser can use PDF house plans to print as many copies as it may be necessary for quoting and construction purposes. The CAD file is used as a source file for future alterations or additions and will be used by an architect or other design professionals to effect such changes.